ActiveHistory.ca is pleased to announce two exciting initiatives at Heritage Toronto, a charitable arms-length agency of the City of Toronto that promotes the city’s rich architectural, cultural, archaeological and natural heritage. 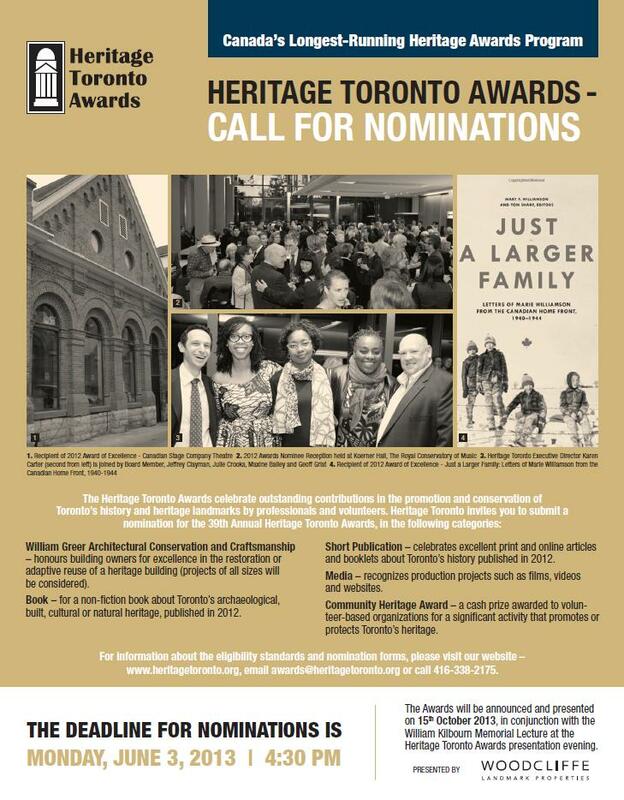 The Heritage Toronto Awards celebrate outstanding contributions in the promotion and conservation of Toronto’s history and heritage landmarks by professionals and volunteers. 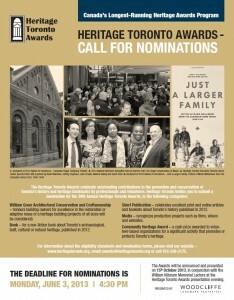 It invites nomination submissions for the 39th Annual Heritage Toronto Awards in 5 categories. Heritage Toronto will be kicking off a fantastic tour season on Sunday April 28th – and there is something for everyone! Many Torontonians know how great their walking tours are – Heritage Torontohas been putting them on for 19 years. Heritage Toronto Tours in 2013 will be a bit different – it’s not just walking tours that they’ll be offering – they’re excited to be expanding their usual walking tour program to include bus, bike, family and boutique tours too! This year’s program will run from the end of April until October and have 58 tours in total, including 26 new tours. Join Heritage Toronto on a tour – they’d love to show you some hidden gems, tell you about some fascinating stories and share with you Toronto’s amazing heritage!